These icons of history still have a place in many hearts. A century after quenching a thirsty America’s westward expansion, vintage windmills are again in great demand—but now it’s largely to satisfy the passion of collectors and the fascination of homeowners rather than the needs of farmers and ranchers. Antique wood and metal windmills are prized as an iconic symbol of America’s past, and their whirling blades and rhythmic creaks and groans are a perfect sound track to a lazy summer afternoon in the backyard. In nearby Sedgwick, Kansas, collector Joe Harper’s passion is fueled by windmill nostalgia and by friends who share the same obsession. “There’s nothing quite like the peace-of-mind you get riding across the pasture in the early morning and stopping at the windmill for you and your horse to get a cool, refreshing drink. I remember it as a kid and still experience it today,” says the 81-year old rancher, whose collection numbers 42 windmills. 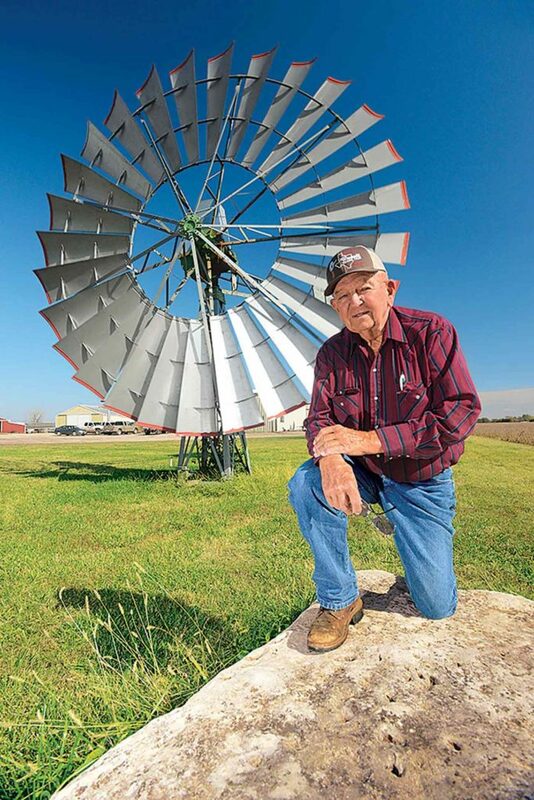 Harper salvaged this 22-foot Challenge windmill from a west-Texas ranch. Harper adds that he’s made tremendous friends as he’s traveled across the country looking for windmills and attending the annual International Windmillers’ Trade Fair. “The trade fair is hosted by either a private collector or one of the windmill museums and it draws hundreds of windmill enthusiasts from the U.S., Canada, and Australia,” he says. “Windmillers stay in touch through a quarterly newsletter—the Windmillers’ Gazette (windmillersgazette.org)—and in a popular chatroom (vintagewindmillparts.com),” adds Baker. The windmill’s legacy in the U.S. began in 1854 with the patenting of a self-governing design by Connecticut machinist Daniel Halladay. Unlike European windmills—which required constant monitoring—Halladay’s wooden design automatically turned the wheel and controlled its speed in changing winds by changing the pitch of the wooden sails, thus preventing damage during high winds. The mechanics. The wheel atop a windmill tower drives a shaft and a mechanism that converts the rotary motion into reciprocating strokes of a pump rod. The rod runs down through a well casing to a piston pump below the water level. The up-and-down action of the pump is coordinated with check valves to lift water to the surface in successive steps. “It’s an ingeniously practical design that’s largely unchanged even to today,” says Jantzen. The wheels of folding ‘vaneless’ windmills were initially made of wood and early Halladay Standard models sold for $50. Wooden solid-wheel designs—which produced greater torque—used a side vane, or tail, to control the wheel’s exposure to the wind. In 1882, Thomas Perry, an engineer in Halladay’s U.S. Wind Engine and Pump Company, devised a windmill with metal blades. When his employer rejected the idea, Perry formed the Aermotor Com­pany (the only surviving manufacturer in the U.S. today). In its first year of 1888, Aermotor sold 24 units and sales shot to 20,000 just four years later. Mass production allowed the cost for a common 8-foot diameter windmill to fall to $25 and competitors were soon selling steel windmills for $17. Originally used to pump irrigation water, this twin-wheel windmill near Roger Bailey’s Nebraska home is one of only three survivors. Lindsay’s book details the design and history of 112 of the most common windmills, many which still dot the landscape today. The book goes into great detail ‘so with good binoculars people can distinguish them from up to a mile away’. The four-pound, 516-page book ($79 at Amazon.com) is literally the bible for windmill collectors—Terry Jantzen has one and Joe Harper has two. The pages are well worn in the copy Murdock, Nebraska, windmiller Loren Lockman uses in his restoration business. 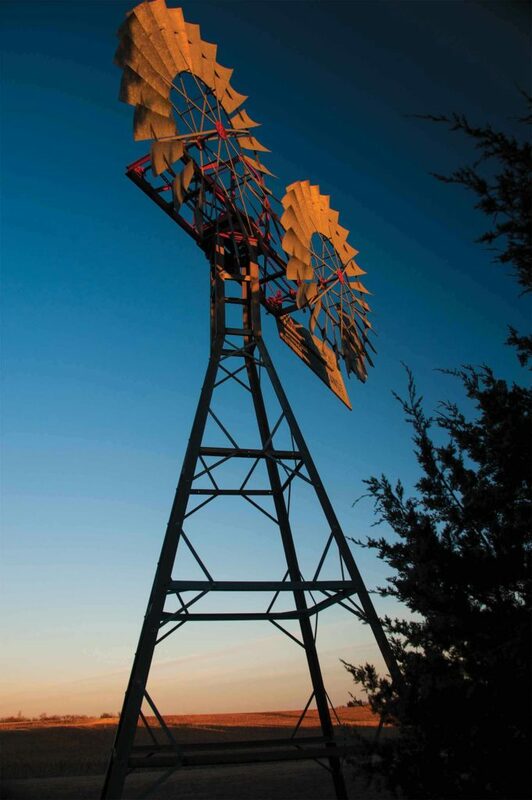 Lockman travels coast-to-coast to find, restore, and resell vintage windmills. On his website (doublelwindmills.com) Lockman lists a dozen antique solid-wheel and vaneless wooden windmills at prices beginning at $3,000. “The price varies by how rare the models are and can range up to $30,000,” he says. The website also offers rebuilt wooden wheels, spokes, and tail vanes for most windmill models as well as new and restored metal windmills. 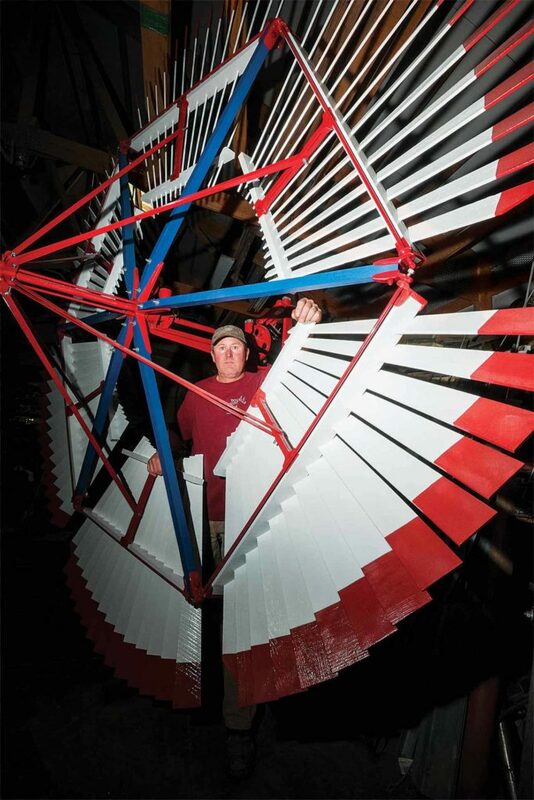 “The wheel and head of a new Aeromotor windmill sells for $2,500 to $4,100 depending on the size, while rebuilt heads—often dating prior to 1933—are slightly less. Towers from 21- to 40-feet tall sell for $1,500 to $2,400,” says Lockman. Loren Lockman travels the country as a modern day windmiller. He restored this Althouse-Wheeler windmill that was ultimately shipped to a collector in southwest Kansas. Harper’s collection includes a wooden Original Star model with a wooden storage tank reminiscent of installations used to refill steam engines on the railway. “We’ve also got a huge 22-foot diameter Challenge metal windmill that was made in 1927. Eight and ten-foot diameter wheels were common in most areas, but in the West and Southwest, where wells had to be deeper, larger wheels were needed to provide the power to pump water from 1,000-feet deep,” he explains. While still used primarily on ranches in the western states, the windmill’s popularity peaked by 1928, when 99,050 were sold. The last census of manufacturers taken in 1969 showed an annual production of 7,562. Passage of the 1935 Rural Electrification Act sped the decline. More recently, solar powered pumps are also replacing windmills. Windmill history in the Midwest is chronicled by records from the McLean County, Illinois, Museum of History. As reported in the Bloomington, Illinois Pantograph, an 1874 county atlas contained illustrations of 50 farmsteads with only two having windmills. A similar effort 13 years later featured 85 farms with 25 windmills while a 1969 survey found 304 windmills with none in actual operation. Forest fire crews serve and protect. Taming wildflowers tests the will of two plant lovers.